The two-chain protein interface in our definition was composed of interacting residues and nearby residues, respectively. The interfaced residues was picked up first. If the distance of any two atoms between residues is less than their sum of van der Waals radii plus 0.5 Angstrom, both residues were registered as the interfaced residues. When assigned interface residues was less than 10 residues, an arbitrary but reasonable number to reflect the minimum requirement of contact, the interface was considered as a result of crystal packing force. Therefore, it would not be considered further. To enable illuminating the types of architectures at the interface, residues whose alpha carbon atom is within a distance of 6.0 Angstrom from an alpha carbon atom of previous assigned interface residues, are included and named nearby residue. The 6.0 Angstrom selected from trial and error is very close to the lowest distance to include residues not involving in interface but essential for demonstrating the scaffold of the interface. We have started the generation of the dataset by extracting the interfaces between the chains from the PDB crystallographic coordinates. As of July 18, 2002; there were 18,687 entries in the PDB which included 35,112 single chains including all individual chains in dimers, trimers and so on. The dataset of interfaces contains 21,704 two-chain interfaces. Fig. below shows an example for interfaces between three chains of the protein GLUTATHIONE S-TRANSFERASE. 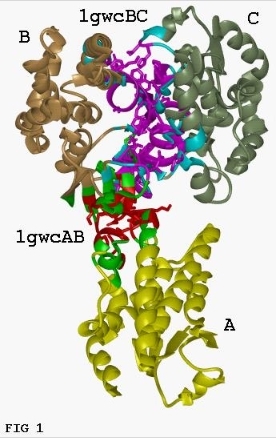 The PDB code is 1gwc. Here the chains AB and BC have contacting residues whereas chains A and C are not close enough to form an interface. So, there are two interfaces. In the BC interface, the magenta are the contacting residues and cyan are the nearby residues. In the AB interface, red residues are the interacting residues and the yellow residues near the red residues are the neighboring (nearby) residues. The sidechains of the interacting residues are also displayed in the figure.